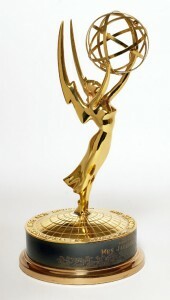 Congratulations to all the winners of this year's Emmy Awards. And especially to my friends at HBO, which once again led all other networks in number of nominations and number of victories. It was a great show this year, I thought. Yes, even without GAME OF THRONES. Stephen Colbert made a terrific host. I especially enjoyed his opening number. A strong lineup of nominees this year gave us some great winners... though, as always, that also means some equally deserving finalists wound up as losers. WESTWORLD especially was robbed, as was STRANGER THINGS. But it IS an honor just to be nominated, and the time will come for both of those shows, as it finally did for GAME OF THRONES. The big winners this year were Hulu's HANDMAID'S TALE (adapted from the novel by Margaret Atwood) and HBO's BIG LITTLE LIES (adapted from the novel by Liane Moriarity). ((Notice the common denominator there? BOOKS! Do a faithful adapatation of a great book, and you can't go wrong)). I was also pleased to see BLACK MIRROR get some love, especially for its brilliant "San Junipero" episode. GAME OF THRONES, of course, was not eligible this year, having shifted from April to August. Which meant that, for the first time in seven years, I was not actually at the awards in LA. Instead Parris and I watched from home. It felt kind of strange not to be there, truth be told. Not bad, just strange. It was actually sort of relaxing. The Emmy weekend can be very exciting, but it is also exhausting, even the parties... the heat, the crowds, the noise. The red carpet seems to get longer (and hotter) every year. Maybe that's an ordeal that should be left for the younger and more photogenic members of our television community. Will I be back next year, or the year after, or the year after that? Time will tell. Emmy is a fickle goddess who bestows her kisses where she will. But either way, I'm good. ((Comments on the Emmys welcome. Off topic comments will be deleted)). I'm pondering your point that you can't go wrong with a faithful book adaptation, and I'm not sure that I agree. Perhaps it depends on which way you look at it - more often than not I'm disappointed in a TV adaptation of a book, but that's from the point of view of a reader not a viewer as an adaptation can never hope to portray all the depth a book has room for. The viewer's point of view, however, is a different story. And TV tends to do a much better job than a movie too just because there's so much more space. of course, there is such a thing as being *too* faithful. I understood Stephen King's motivation in making an adaptation of The Shining far more faithful to the book than the Kubrick movie was, and was excited to see it, but to my surprise I greatly preferred the movie. It certainly answered writers' plaintive question "Why do they CHANGE THINGS?"